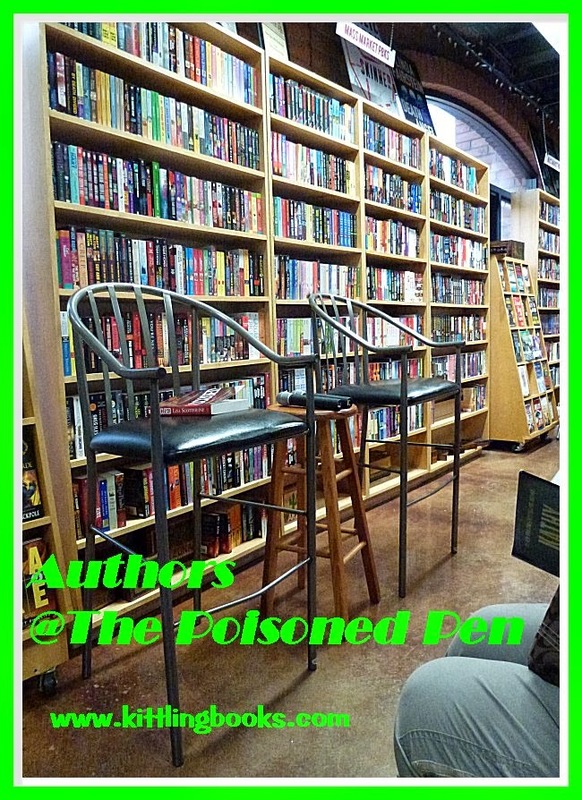 @ The Poisoned Pen with Spencer Quinn! 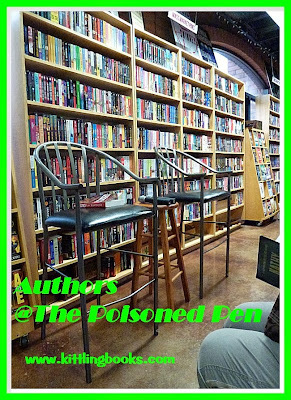 Once again I was introducing Denis to a new-to-him author by heading over to an author event at my favorite bookstore, The Poisoned Pen. Denis had never heard of Spencer Quinn before, but he loves dogs so I thought he'd enjoy the evening. As Spencer Quinn, this talented writer has created a wonderful series featuring Chet the dog and his guy, a private investigator named Bernie. (If you don't think Chet is popular, I won't tell you that he has his own website.) 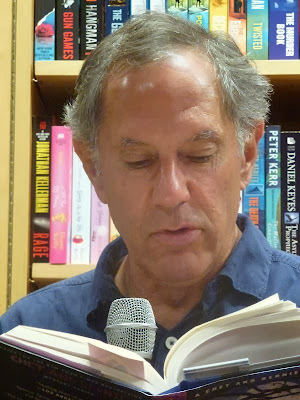 As Peter Abrahams, he's gifted us with mysteries for children and young adults, and several non-series mysteries for us grown-ups. For a listing of his books, head on over to Stop, You're Killing Me, one of my go-to crime fiction sites on the internet. Quinn's Chet and Bernie series is a bit Holmes-esque with Bernie as Sherlock and Chet as Watson. For these books, Peter Abrahams' agent and wife decided that he needed a new name, and thus he became Spencer Quinn (which is how I'll refer to him throughout the rest of this recap). The first questions Poisoned Pen staff member Lea asked Quinn was, "Do you speak Dog? Did you start writing these books because of your dogs?" to which Quinn replied, "I wanted to write a story told by a dog-- as purely canine as I could make him. Chet is no human in a dog suit. He doesn't speak, but we've all wondered what goes through our dogs' minds." When Quinn got his idea for a book told by a dog, a vote was taken in the household, and the idea passed by a vote of 2 - 0. "We did this when our kids weren't home; otherwise, the vote had a good chance of being 4 - 2," Spencer quipped. "I love writing these books in the voice of Chet. Dark things happen, but Chet bounces back to his reset position very quickly where things are good. I've found that rubbing off on me, so I guess you could say that I'm being affected by my character." He then went on to say that one of the perks of writing a series like this is that he "can't get an email stating what occurred on page 93 couldn't happen." Quinn's house in Massachusetts overlooks a salt marsh, and he watches the family dogs as they play and investigate the area. "They always look like they're having more fun than me," he says. One of the ways he tries to incorporate a dog's mindset into the books is to focus on the senses of smell and sound. Chet is an unreliable narrator, since he can get "distracted by a Cheeto under the couch, but he more than makes up for that by being a very reliable detective." 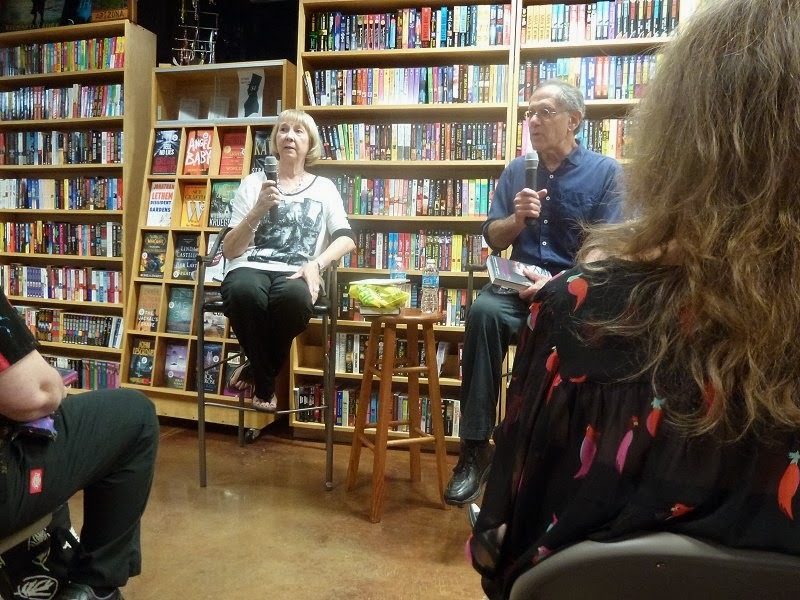 Someone in the audience proved that readers are very observant when she asked about Chet's changing appearance over the span of the series' book covers. Quinn looked back at the recording equipment and asked, "Is this the type of Livestreaming where my publisher can see it?" When we finished laughing, Quinn answered the question. "Readers are 'end users' to publishers. 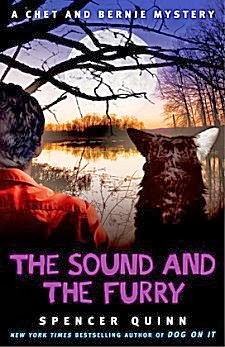 I've been fighting with them about that dog, and I'm happy to say that I won with the cover of The Sound and the Furry-- although the dog on the back is different!" "If anything happens to Chet...."
Quinn has published two eBook short stories. The one titled "A Cat Was Involved" he refers to as "the origin story." It's all about the day Chet flunked out of K9 school. "There was a cat. And maybe some blood." The Chet and Bernie series has another canine character named Iggy. Some readers have told Quinn that they're upset that Iggy never gets outside. "I think there's a Free Iggy movement," Quinn says with a twinkle in his eye. He's since written another eBook short story titled "The Iggy Chronicles, Volume One" for all this housebound pooch's fans. As further evidence of the sharp eyes of Chet and Bernie fans, Quinn told us another story. In book one (Dog On It) when Chet is groomed, a suspicious-looking spot is discovered, and it is biopsied. For the next two books, not a word was said about the results of the test. Quinn began getting emails written all in caps: "IF ANYTHING HAPPENS TO CHET I'LL NEVER READ ANYTHING ELSE YOU WRITE, AND I'LL FLOOD AMAZON WITH ONE STAR REVIEWS!!!" Another person in the audience wanted to know where exactly is "the valley." From the books I've read, I always thought it was obvious that "the valley" was here-- the Phoenix metropolitan area-- but there are many readers in California who swear it's in their state. Quinn reassured us that Chet and Bernie live here in Arizona and read an excerpt from The Sound and the Furry that makes it crystal clear to everyone. ("You have to read five books and 93 pages to find out the setting.") And as for another canine that was introduced and then not mentioned again: "I promise we'll be getting to that puppy! This is one of the fun things about a long-running series. I get to introduce things that may take a book or two to fit into the story line. And in fashion news, there is a change of collars in store for Chet." Fan question: What about your other writing? Quinn grinned and proceeded to tell us about winning an Edgar Award in 2009 for Reality Check, a non-series young adult mystery, which has now led to a middle grade series called Bowser and Jolene about an amateur sleuth for Scholastic. "Right now I'm really enjoying what I'm doing." In the next Chet and Bernie book, the duo are leaving Arizona because Quinn wanted to get Chet on the road... and into the water... and on a boat. "It's a John le Carré - Graham Greene thing... narrated by Chet." "We almost got into a legal situation..."
Since I'd never been to a Spencer Quinn Event before, this next section was a complete surprise to me. Quinn conducted a pop quiz with "prizes for right answers and fines for wrong answers." Last year, the prizes for his pop quizzes were orange Frisbees that Quinn would wing out to the winner, "but we almost got into a legal situation, so this time you get Chet and Bernie stress balls!" 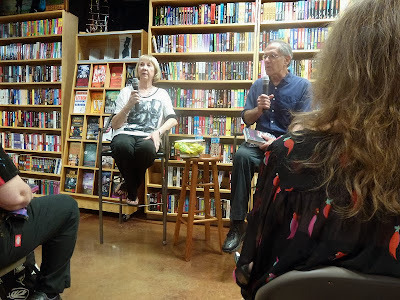 After the quiz, Quinn told us about a book signing in San Francisco where the "people knew more about Chet and Bernie than I did-- including a nun who disagreed with one of my answers and got me to change my mind." Fan question: Is Chet ever going to be able to count past two? Quinn: "Two is the best number, and Chet has no incentive to go past that, so... no." As the event began to draw to a close, Quinn mentioned something that put an even bigger smile on my face: "The engine that makes the Chet and Bernie story go is the love between Chet and Bernie." How true that is! Another fan asked him about voice. Quinn told us that as Peter Abrahams, he writes in the third person. As Spencer Quinn, he writes in the first person, and "I love writing in Chet's voice." Fan question: What do you like to do when you're not writing, and how do you spend your time while you're on a plane? Quinn: "I enjoy reaching the end of a book, but after two days I begin itching to start something new. I play a lot of tennis. I go to the beach. And I do a lot of writing while sitting on a plane." As Denis and I returned home, we spent most of our time talking about this talented author. Spencer Quinn knows how to hold an audience in the palm of his hand, and he kept all of us laughing. Know that if you attend one of his author signings, you're going to leave with a big smile plastered on your face. Cathy - Oh, it sounds as though I would (leave with a smile, that is). I'm so glad you enjoyed Quinn's visit to PP. Always so nice to get to know the author a little. I enjoy books with dogs as characters so bet I'd love these. It cracks me up to think of them taking a vote at home without the kids! I think you'd really enjoy these Chet and Bernie books, Kathy! I would love, love, LOVE to go to an author event with Spencer Quinn. I love, love, LOVE Chet & Bernie. Lucky you! Yes, I am *very* lucky, Debbie! I downloaded Iggy and A Cat Was Involved. I'm glad he told us they were available because I usually don't think to go looking for digital short stories. Glad I could help! This sounds hilarious. I'm glad you and Denis had fun, and I had fun just reading the write-up. Talk about laughing. I must read some of these books. They make a wonderful change of pace from much darker fare-- even though dark things do happen in them. Chet does a wonderful job in helping us readers keep perspective.